10.1 Enjoyed Reading this Post? SIGN UP for more. This was our introduction to the area and the drive up Arthur’s Seat was fantastic with beautiful views over the Bay. The Enchanted Adventure Garden is one of those places you don’t find as much in North America. It is an independently operated theme park. It is quirky and unique and our kids loved it. Read my full review here. Nippers cost $49/adult, $39/kids and includes admission to the rest of the park. Tranquil hot springs may not sound like a great place to take the kids, but Peninsula Hot Springs warmly welcomes families. There are 20 different bathing experiences to try from a Turkish hamam to a reflexology walk to cold plunge pools. 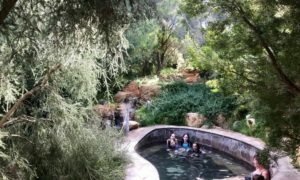 Families have access to at least half of the bathing experiences and our kids loved the family pool with bathing buckets and carved stone baths to climb into. If you can come mid-week, it will be quieter and cheaper. Before 10am, families have access to the hilltop pools where you can experience incredible views over the Peninsula. There is just something about walking around the peaceful gardens in a bath robe, sampling the different pools that is so enjoyable. Weekends away always include ice cream for our family. Mubble is gem of a place and one we really look forward to because the ice cream is delicious, home made and reasonably priced. Our kids love that they can get 2 flavours for $3.50 and there are so many yummy flavours to chose from. There are usually lineups out the door, but it is worth the wait! A weekend by the sea is not complete without fish and chips. We like ours from Fish Fetish in Sorrento, along the main street. I like the snapper, which you can get fried or grilled. For non-fish lovers there are other good options like burgers. This is another place that can get really busy. Tip: even if there is a line out the door, you can usually order by phone and pick up when it is ready. 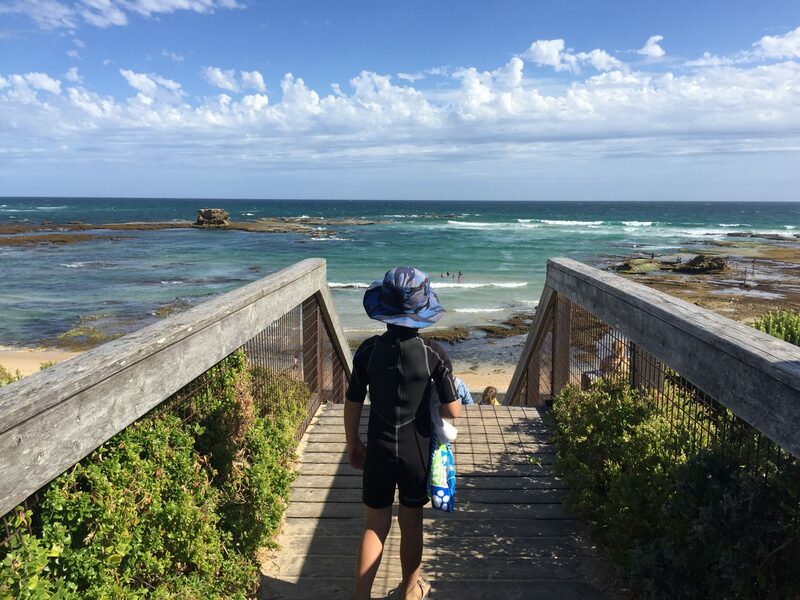 Sorrento Back Beach is on the ocean side and is a great place on the Mornington Peninsula with kids. It is a patrolled beach (swim between the flags) and there is good surf for the kids to try out their boogie boards. For the little ones, there are lovely tidal pools that are calm and slightly warmer than the ocean. Come during low tide and the kids can enjoy cliff jumping (6 feet) into one of the larger pools. There are fun caves and rock formations to explore and you can hike up to the lookout rotunda for a beautiful view along the coast. Shelley Beach, between Sorrento and Portsea is a great alternative to the Bay side beach of Sorrento. The beach here is located along the strip of mansions hugging the cliffs and many don’t realize their is public access to the Beach. Look for signs to the carpark and then it is a bit of walk down the cliffs and dunes to the beach. Once you are there you will feel like you have the beach to yourself and can enjoy the calm Bay waters, watch the boats sail by and build sandcastles for hours. This hike is the perfect distance for kids (1.5 km return) and a great option when exploring the Mornington Peninsula with kids. The kids will be excited about the “Lifestyles of the Rich and Famous” as you walk the fenced clifftop along the mansion’s backyards between Portsea and Sorrento. The adults will love the beautiful Bay views and it is pretty surreal to see how the 1% lives. Thanks to the walkway being on crown land, anyone can do this walk. It does feel a bit funny at times walking right across the yards of these impressive homes. Park at Point King Rd or Lentell Ave and do the return walk. There are the occasional open gates you will walk through, but don’t worry, you are not trespassing! There is a monument near Point King to commemorate the first fleet arriving here and this is a section of the Portsea Sorrento Artists’ Trail. There are some great playgrounds in the area and this is a great way for the kids to run off steam. Sorrento Park at Port Nepean Rd is a win for both kids and parents. Kids will love the huge wooden playground and flying fox. The adults will love the breathtaking location with views of the Bay and lovely gardens. This would be a great place for a picnic. Another favorite playground is the Rye’s Up! Community Playground. This is another huge wooden playground the offers hours of entertainment. 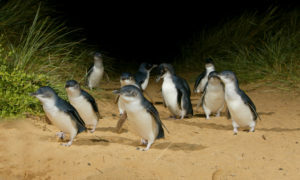 Located in Mornington Peninsula National Park, this is fantastic place to spend a few hours. Take the short circuit walk to the wooden boardwalk that leads to the cape. The scenery is unbelievable and kids can stay busy scanning the sea for whales and seals. You can also tour the lighthouse and museum, where the tour guides are in period costume ($38/family). 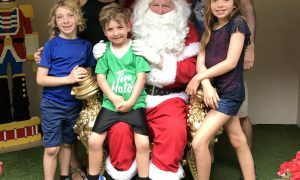 If you can pull yourself away from the beautiful beaches, another great attraction on the Mornington Peninsula with kids is all the super cute foodie opportunities throughout the hinterland. 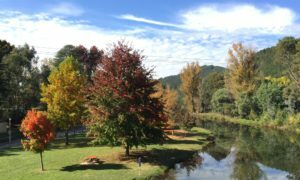 There are lots of cute wineries that are kid friendly and loads of great cafes, breweries, farm stands and markets. We enjoyed a great lunch at the Gorgelicious Store in Red Hill, where the kids play area and homemade chicken strips and chips were a big hit with our kids. We finished it off with desert at Johnny Ripe, infamous for their apple pies and other delicious treats. It was raining the day we were there, but Sunnyridge Strawberry Farm is another great stop in the area. Here you can pick your own strawberries or simply buy some fresh ones at the store and cafe. You could spend days exploring all the quaint places in the hills. Located at the very end of the Mornington Peninsula, this is a great place to bike, hike and explore the forts, quarantine station and coastal views. It was raining the day we visited, but I am looking forward to exploring more of this National Park next time. The Mornington Peninsula makes a great day trip or weekend away from Melbourne. There are still so many places I want to visit and check out there. Kids will love the safe swimming beaches, playgrounds and national parks waiting to be explored. Best of all, its proximity to Melbourne make it an easy getaway. Did you find this post helpful? PIN it to Pinterest.